Spending time in nature can have many wonderful healing effects; mentally, physically, emotionally and spiritually. My love and appreciation of nature began with hiking; meandering through the mossy, boreal wonderlands of the beautiful East Coast Trail. Almost from the start my worries, anxiety, and frustrations would melt away, dissolving into the moss and duff of the forest floor. I soon realized something was happening, behind the scenes so-to-say, something profound. It felt wonderful, and it wasn’t the exercise of hiking – there was something more at play. After some research I came upon the term Forest Bathing, little did I know at the time - I had found my calling! 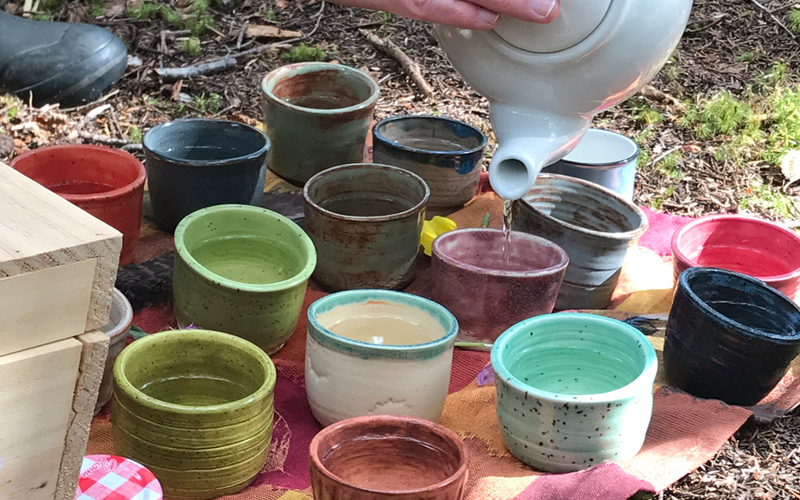 Certified Forest Bathing Guide - Tina White, pours tea for participants. Tea Ceremony concludes our walk, and is our way of emboding and ingesting the forest! 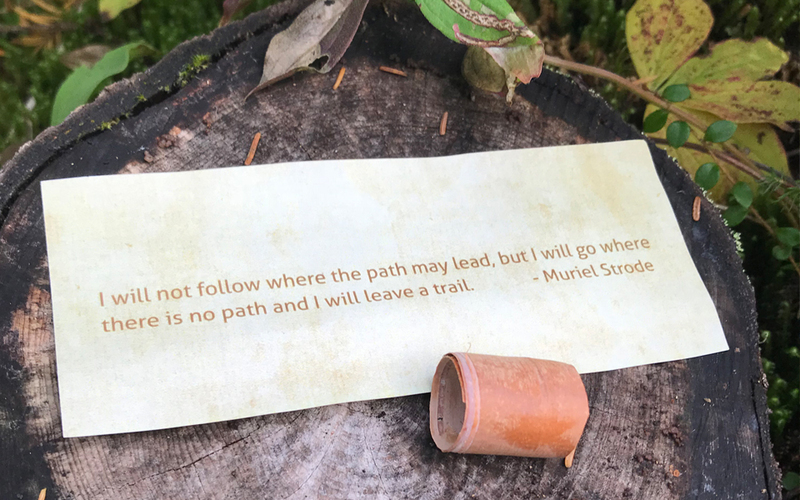 Guided invitations help us to connect more deeply to the forest. 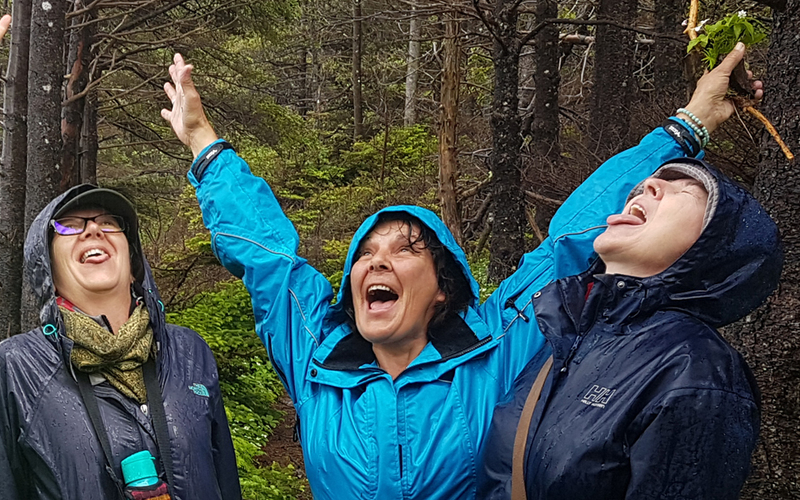 Catching and tasting rain drops (Tors Cove/Spiritual Retreat group). 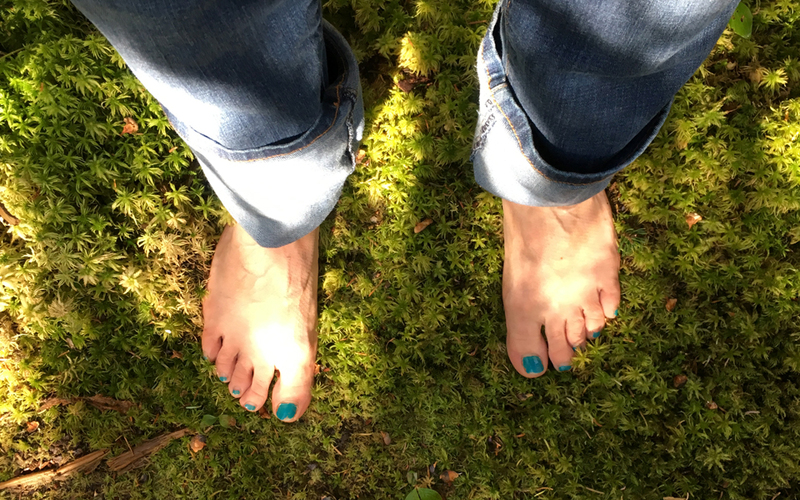 Join nature-lover, avid hiker and paddler, and now Certified Forest Bathing Guide – Tina White, for a guided Forest Bathing walk. 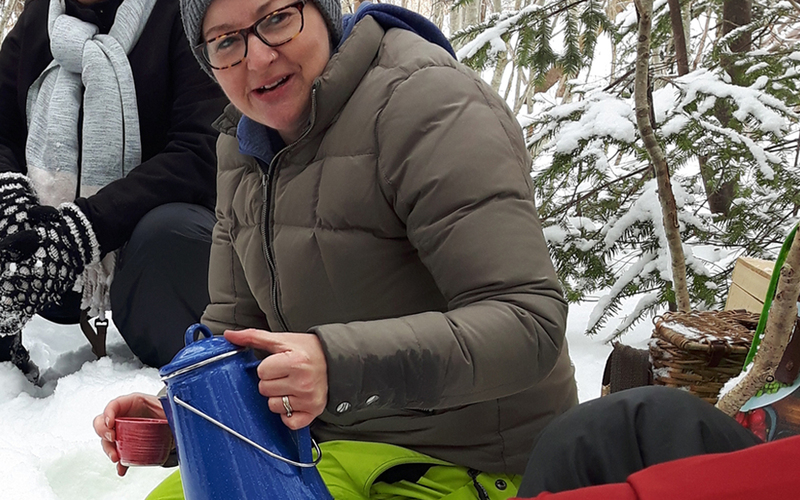 Tina recently trained with the Association of Forest & Nature Therapy Guides & Programs and is excited to be the first Certified Guide in the province. Walks are offered in a variety of locations, including Pippy Park, Portugal Cove-St. Phillips and Tors Cove - throughout all seasons. Join a public walk, request a private walk or book a private group walk for your group. This is a great addition to a retreat, workshop or conference, or a great outing for groups of any kind. 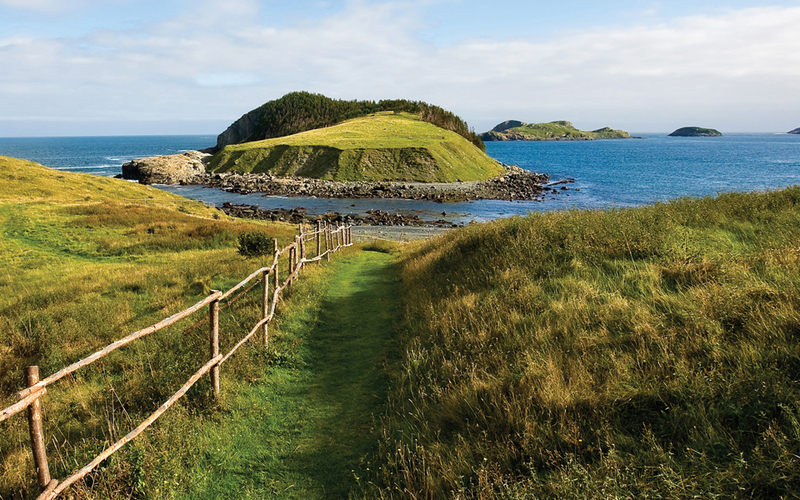 This adventure is set in the beautiful, seaside community of Tors Cove, a tiny coastal village nestled in the Witless Bay Ecological Reserve (about 30 minutes south of St. John's). 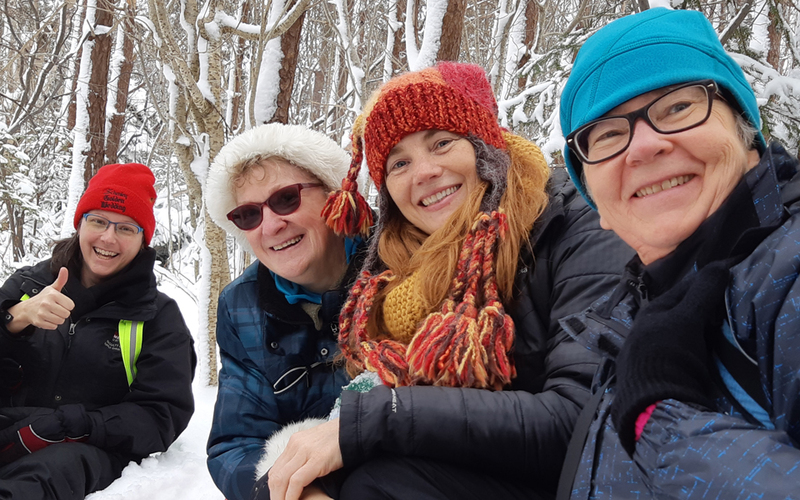 Enjoy a guided walk with a local storyteller (and certified Fairyologist) to ‘The Cribbies’, home to some of the most photographed salt box homes in Newfoundland (not to mention the Fairies). Learn all about our rich Fairy lore, what can be expected from the ‘Little People’ and how to protect yourself from such encounters! If the winds aren't too strong we'll share a mug-up on the beach (hot and cold beverages, local treats)! Children and adults alike will enjoy this enchanted woodland walk. 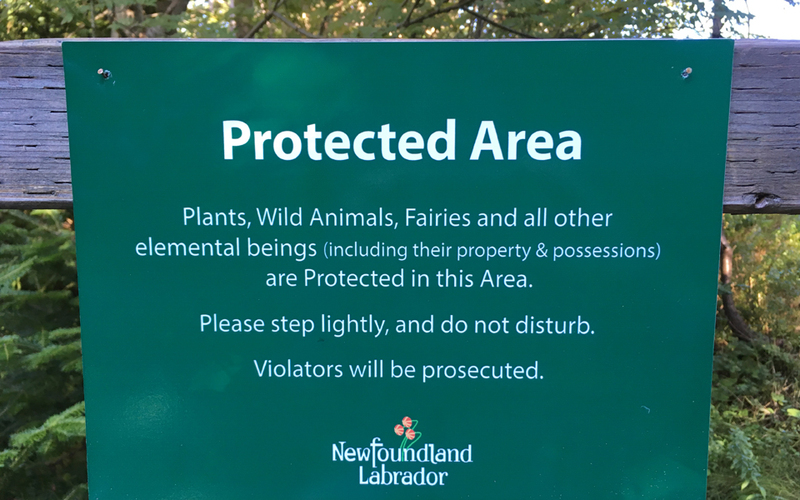 Visit a series of whimsical fairy, elf and gnome homes scattered along a picturesque nature trail. There will be opportunities for wishmaking, leave a letter in the fairy mailbox and more. Weather permitting a fairy storytime will conclude this nature adventure. Treasure Bags will be provided... these little bundles contain shells, marbles, special stones, wool bits... things thay may come in handy on the tour - or a small gift for a Fairy.